Contrary to the popular belief, designing a kitchen isn’t all fun and games. You can’t simply access Pinterest boards and pick a design for your new cooking space, especially if you live in Pakistan. Homeowners in Pakistan needs to understand that our environment and lifestyles differ from those living in the western world. We cook food with tarkas and bhagars. We socialize and entertain in a completely different manner. For us, a kitchen is the hub of the house. It is where the entire family convenes for lunch and dinner. 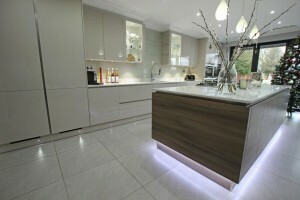 So how on earth you can blindly follow foreign styles and latest trends when designing your kitchen? But, this doesn’t forbid you from staying current with the latest trends that will rule the cooking spaces in 2017. 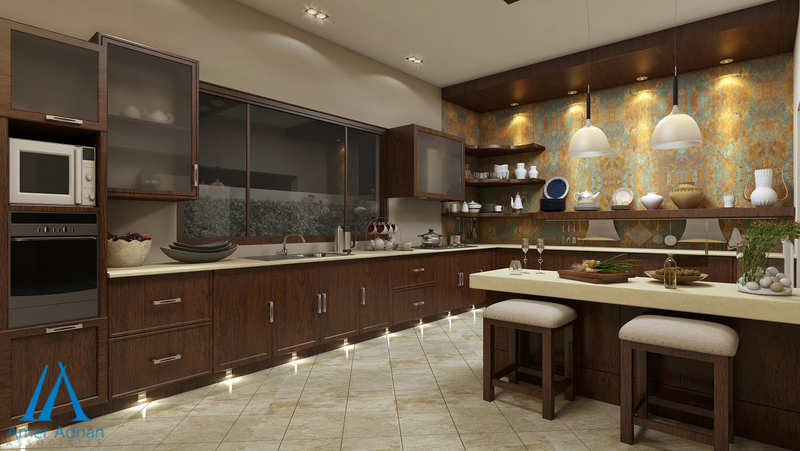 All you have to do is to keep your social setup and lifestyle in view when choosing a kitchen layout or design. 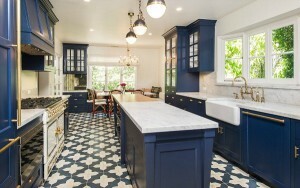 To help you out, designers at AmerAdnan Associates have spotted what’s in and what’s out in 2017 kitchen design trends, so you can easily incorporate them in your new cooking sphere. If you are looking to veer away from all-white kitchen, then relief is surely in sight. In 2017, homeowners have the liberty to mix up their kitchen’s color palette. Leading architects and construction companies in Lahore are suggesting their clients to use colors such as navy, cream, deep charcoal and black. Whereas, shades like taupes and grays will stay and remain popular choices for cabinetry to create a softer contrast. Natural materials such as tiles will see a swelling demand in 2017. Explosion of size will be observed as interior designers in Pakistan will favor large-format tiles in kitchens as opposed to traditional 12” x 12” tiles. Besides the striking looks, large-format tiles give you less grout lines to clean by covering more surface. However, property owners should remain cautious when opting for large size tiles because they are heavy and require perfect level substrate and a skillful installer to come out right.